I have to decide which of these pictures to have as our framed picture. I CANNOT decide. These 8 are our top 8 choices and they come in a little album. But which one to get as the large one, we can't decide! I love these pictures, and I'm SO happy with them! And it was a lot of fun having our first professional pictures taken together! Today I am busy baking 6 layers of cake to make 2, 3 layer cakes! One chocolate and one vanilla. YUM. Tara's early birthday party is this Friday, and for some reason I agreed to make the cakes! I'm crazy! Haha! The Swedish thing of the day is this beautiful tree. Spring really is here, and I love it! Saturday we went to the Botaniska Trädgården (Botanical Garden). It was amazing! Much bigger than I thought it was! Lots of different gardens and even a herbal smelling garden. We went on a hike to a very huge hill that over looked the city. We are definitely going back soon. Kansas has many gorgeous tree's, bushes and flowers, but this tree literally took my breath away. The picture doesn't even do it justice! The Swedish word of the day is "bild" which means "picture" and "bilder" means "pictures". Today is 100 posts. I don't have anything significant to talk about but here are some pictures. This was taken at 10:30 last night. Yea...it's getting harder and harder to sleep. The sun is coming up around 5 but it's already starting to get light out around 3:30-4. This is a murder slug, and they are evil. Although, Fredrik told me yesterday you can boil them and eat them. I threw up in my mouth a little bit when he said that. This is funny cause it looks like I'm a floating head going around kissing people in their sleep. I posted a Swedish breakfast awhile ago, but this is an american breakfast. Maybe slightly modified with yogurt and a banana, but don't worry, there was a lot of butter and maple syrup on those pancakes! This is my springtime, Swedish umbrella. I look like a fool carrying this around amongst all the black and dark blue umbrellas most Swedes carry, but I don't care! This is your Swedish thing of the day. This is Fredrik's favorite bread, ever. I don't know how he will survive without it in the US. But we might have to steal the recipe and learn to make it. He eats this at least twice a day. Breakfast and snacks. He loves it. 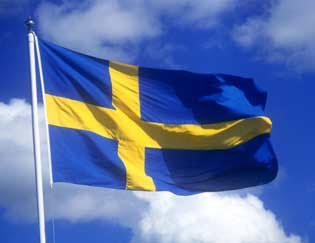 Basically, the Swedish graduation is like ours, only with it's own twists and flare! They have a ceremony like ours, but it's a lot less formal. As you can see, no gowns, no square hats. Although the boys do wear a suit and tie and the girls wear a nice dress, which I think is usually white or mostly white. After the "ceremony" they go to be greeted by friends and family, who adorn them with gifts and get their picture taken. After that they go around in taxis or cars and some schools rent huge dump trucks for all the students to go around together on holding signs and posters and screaming and shouting through the town. Sounds fun! 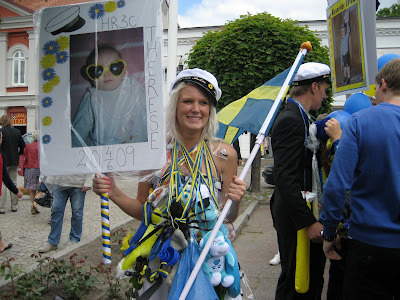 Each family makes their graduate a sign that has a picture of them when they were small (usually embarrassing), their name, the day and year they are graduating and which school they are graduating from (in Sweden you chose a school at 16, and you learn a vocation. i.e Fredrik chose to learn mostly about cars). The posters are really big and very sturdy and are on a stick, so they can carry them around. You have to go to a special place (like kinkos) and get it made. Fredrik still has his. He's so cute! Then after the riding around they go home, much like we do. Have a party with your family and once you can get away from that party you go away with your friends and have a great night! I like the way we do graduation, but this way also seems like a lot of fun! My brother and sister graduated from high school this weekend! How proud I am! Congrats Brad and Mikaela! particular cheese went a little hard on the bottom so I was advised to cut it off and throw it away. But hey, why not take advantage and create a love message. Stupid me. This cheese is like the cheese you imagine a little mouse coming out of. It has holes and everything. The Swedish word of the day is "grattis" which means "congratulations". You also use it on birthdays too. Congratulations on your birthday! Just another Monday. Nothing special, nothing new. A giant Dutch apple with peanut butter. Don't worry, I haven't TOTALLY forgot how to eat like an American. TRYING to listen to some Sia, but unfortunately Tara has a friend over and they won't stop whistling. This is Tara's new favorite thing and I can hardly stand it! Not a whiskey sour, but this is pretty good in itself, Ramlösa mixed with Pomegranite smoothie style juice. Really yummy! 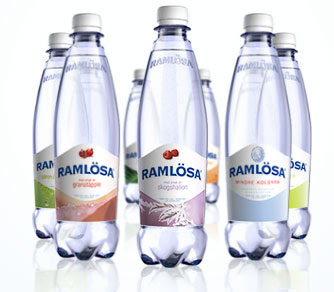 This is bubbly water with lots of different flavors. I like original, but sometimes I venture out and drink some jordgubb (strawberry). A Rice and Curry cookbook and writing down as many recipes as my little cook book can hold. I've really become interested in Indian cooking, and Fredrik and I certainly love to eat it, so why not learn to cook it! This weekend. Helping Fredrik's parents at their cabin, getting ready to put a new addition on to the living room. Forecast looks promising, sun and warm temperatures. Simple, make your own burritos. Complete with homemade tortillas, ground taco beef, cumin cheese, sour cream, tomatoes, cucumbers, peppers, lettuce and salsa. Caitlin isn't done with school until June 15th. What a long time! Spending a month and a half with no work, no commitments. With my honey, in the beautiful Swedish summer. Midsummer here we come! The next few weeks are going to be quite a bore, just waiting and waiting for June 15th!